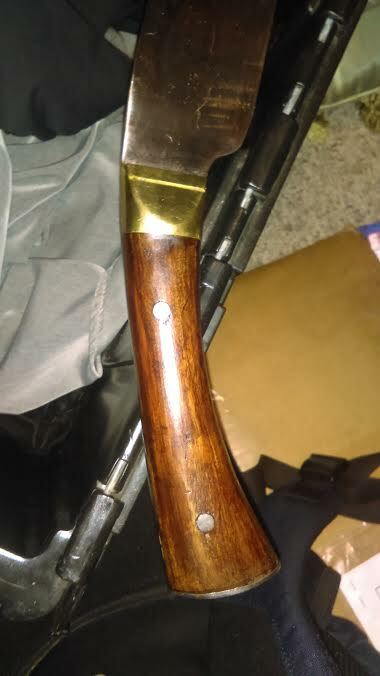 Up for sale is a really lovely and unique Seax. This is a monster with a 16 1/2" blade. 23 1/4" overall with just shy of 1/4" blade thickness. Steel pommel cap and a brass bolster, hardwood scales with steel pins on the full tang. Also of note is the nice fuller that is present on both sides of the blade. POB is about 2 1/4 inches from the bolster with a weight of just over 2 pounds. This guy has plenty of heft, but handles really nicely despite. Country of origin is unknown to me but I suspect indian work. Fit and finish is good and comes with a heavy leather sheath. Condition is brand new with original packing grease still on the unsharpened blade. $100 and figure $15 shipping CONUS. This is gonna make someone very happy when they get it. Price drop. Found out that this is a deepeka. I usually don't care for their items, but this is super solid and nicely done.